Summary: Missy didn’t mean to cut so deep. But after the party where she was humiliated in front of practically everyone in school, who could blame her for wanting some comfort? Sure, most people don’t find comfort in the touch of a razor blade, but Missy always was . . . different. My review: What really struck me with Kessler's first book, Hunger (Horsemen of the Apocalypse series), was the ingenuity of her storyline. The author gave the lore of the Apocalypse a spooky, supernatural twist and singled out one rider (Famine) by pairing this role with a teenage girl suffering from the very serious issue of anorexia. The result was a fast, thought provoking and tense read. Despite the short length, the story came alive for me by Kessler's vivid writing. What could have easily been a dark, somber read was energized by the humorous figure of Death and an interesting cast of secondary characters. With her second book, Rage, Kessler only continues lifting the bar for quality story telling.This author can stir up emotions within a reader using a lesser amount of words than many other of today's writers can. Melissa Miller, "Missy," is a goth girl who self-mutilates when she can't deal with things in her life. Her ex-boyfriend Adam, who discovers her problem, is a real gem and instead of helping her does something to her at a party which made me uncomfortable for days. Missy can't deal with the humiliation and heads home to take out the small box with her cutting tools. When Death comes a knocking she simply slams the door shut on him. Now she's clearly a girl with issues, but she has sass and Death finds that trait appealing. When life treats her badly, Missy begins to think Death's offering of her becoming War could be something she can handle. As she learns to handle her new role she also learns what it is to be in control, of both her life and her otherworldly position. And who can turn down Death when he looks like Kurt Cobain and strums a guitar sitting in your yard? 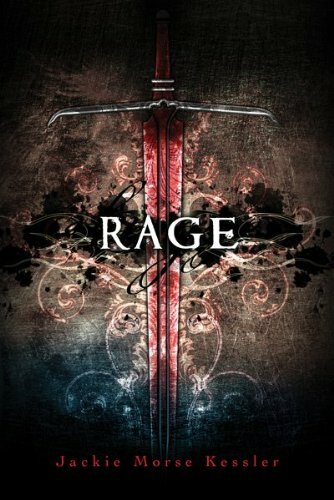 Rage, like Hunger, is not the type of book a reviewer can go on and on about. The book has to be experienced. Dark, gritty and brutally honest, this series is not for lightweight readers. Its subject matter is heavy and realistically described by a talented author. The set-up of the second book may seem like a template of the first and in a way it is, but the similarities end there. Each book stands on its own strengths and has characters and situations with staying power. I can only wonder what topic this author will tackle in book number three. Can't wait. Recommended. Favorite excerpt: "Melissa Miller, the most powerful sixteen year old in the universe, rode through the skies atop her fiery red steed. Bruised from the wind, Missy grinned wide enough to split her face. This was roller coaster giddiness and freefall elation--better than ferociously defending the goal in soccer, or acing a test, or even that magical first kiss. This was the epitome of exhilaration, all white bubbles tickling her skin. This, in other words, was the most incredible thing that had ever happened to her. They soared, and beneath them, the world waited. Missy wanted to see more. The warhorse, either intuiting or understanding its Rider's intent, swooped lower, giving Missy a bird's eye view of a slumbering city. Pinpricks of light pierced the nighttime darkness, illuminating occasional houses and the rare open business. Parked cars littered the roads like children's toys, scattered and forgotten. Wherever they were, it was too late to be night and too early to be morning. Missy blinked, and they left the city far behind. Ares climbed higher, and soon the world was once again a smudge beneath them. Cover comment: Dark, similar to the style of the first.